Valve Lockouts Are Used For Blocking Valve Handles From Unvwanted Movement And Position Change. Valve Lockouts are solidly made for long lasting durability and dependability. Available in a variety of styles to meet particular application. Rotating Gate Lockouts surround the valve operating handle to protect against accidental valve opening. 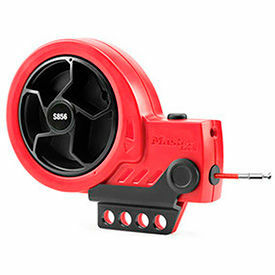 Used for confined space applications. Valve Wheel Lockouts consist of 2 flattened half moons that completely cover the valve wheels from 1" to 14" in diameter. Ball Valve Lockouts lock ball valves safely and efficiently. Butterfly Valve Lockouts are universally designed for butterfly valves. All meet OSHA 29 CRF 1910.147 regulations. Electrical Lockouts Keep Employees Safe By Locking Out Equipment And Energy Sources. Prevent machinery and equipment from being used by locking out electrical outlets and power cords. 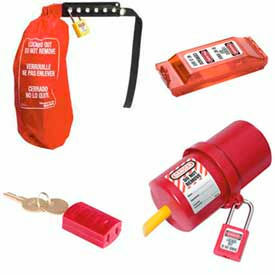 Electric switch and plug lockout devices are designed for quick, easy use with a wide variety of equipment. Choose the size and style that fits your needs. Meets OSHA 29 CRF 1910.147 regulations. 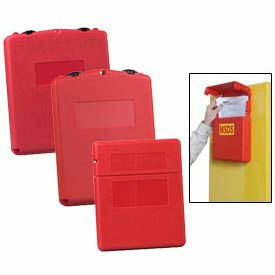 Justrite Document Storage Boxes Are Used For Storing Important Documents And Making Them Readily Available. Justrite Document Storage Boxes are made of weather resistant polyethylene for long lasiting durability and moisture protection. Large label area for easy identification. 2 blank and 2 printed labels. Highly visible bright red color. Easily installs with heavy-duty double-sided tape and four built-in mounting holes. Padlockable for security. Available in Medium Top Opening, Medium Front Opening and Large Front Opening models. Gas Cylinder Lockouts Secure Main Cylinder Valves and Prevent Outside Interferences. 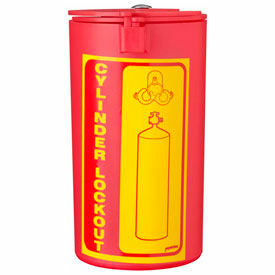 Gas cylinder lockouts hold cylinders in place for safe storage. Polypropylene material is non-conductive to prevent dangerous sparks or combustion. Bright color with lockout warning message is easily identifiable from a distance. Unit surface material is crack-resistant polypropylene, which provides lasting durability. Specifications vary per model. Confined Space Covers are OSHA Compliant for Confined Space Standards. 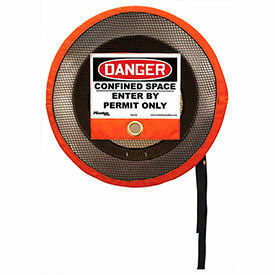 Confined Space Covers have lockable straps to secure cover over the confined space opening, The cover also acts as a barrier to entry to protect affected employees and exceed OSHA standards. The solid front cover keeps out debris, weather, and pests. Wide lockable straps feature 25 grommets on each side to cover the flange and adjust the fit before locking the cover. Cover can be easily cleaned, stored and reused while also standing up to extreme environments. Dimensions vary. 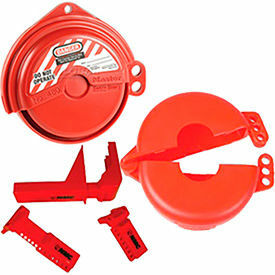 Retractable cable lockout devices for a variety of applications. Rugged Zenex™ housing stores unused cable. Ergonimic take-up wheel retracts the cable. Deep pockets allow for easy operation. Contoured Design allows stacking of multiple devices. Choose the S856 with Steel cable or S866 with Nylon cable.